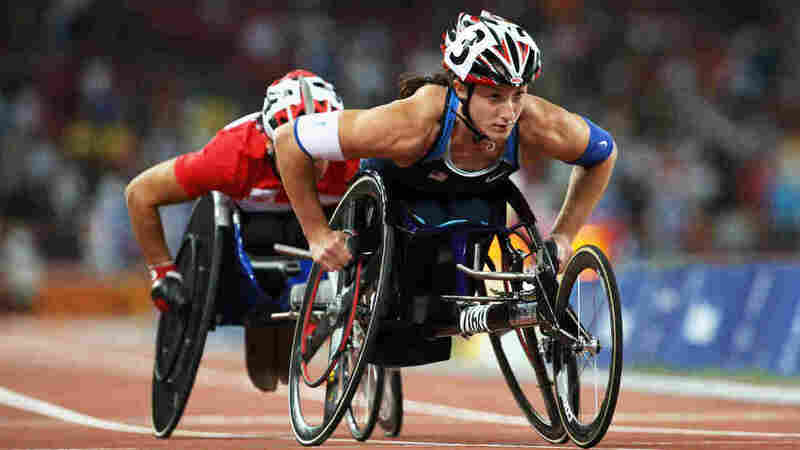 Paralympian's Pursuit Enables Aspiring Athletes Champion wheelchair racer Tatyana McFadden's fight to compete alongside able-bodied athletes opened up civil rights laws providing more opportunities for her sister and other disabled athletes. The sisters will compete against each other at the Paralympic Games in London. 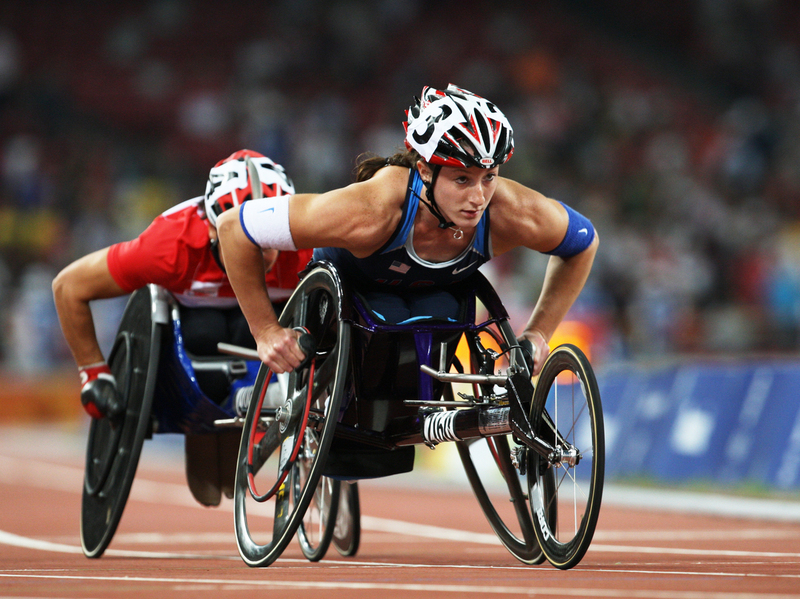 Tatyana McFadden has won medals at the Paralympic Games in 2004 and 2008. At this year's games in London, she's participating in every wheelchair race from the 100-meter sprint to the marathon. At the Paralympics Games now taking place in London, two American wheelchair racers from Maryland will make history: Tatyana McFadden and her sister Hannah will be the first sisters ever to compete against each other at these world championships for athletes with disabilities. The story of how these sisters came to race each other illustrates the opening up of civil rights laws, providing people with disabilities more opportunities — including sports. It was a legal fight by Tatyana to win the right for herself, and now Hannah, to more fully compete in school sports. And that helped them advance in international competition. Tatyana, 23, has already won medals at the games in Beijing in 2008 and Athens in 2004. She has also won eight world championships and marathons in New York and Chicago. London is the first Paralympics for Hannah, 16. Tatyana was born in Russia with spina bifida, paralyzed from the waist down. "I was adopted from Russia at the age 6," she says. "And I was very anemic and weak. And so the only point that saved my life was sports." When she says sports saved her life, she means it — literally. Deborah McFadden, the American who adopted her from a Russian orphanage, bought Tatyana her first wheelchair and then encouraged her to participate in sports as a way to get her healthy. McFadden says every time she introduced Tatyana to a new sport, she took to it right away: swimming, gymnastics, wheelchair basketball, and downhill skiing. "She kept saying 'ya sama.' And ya sama in Russian doesn't mean: I can do it. It means, I can do it myself. So I'd say, 'Let's go swimming.' 'Ya sama. Ya sama.' 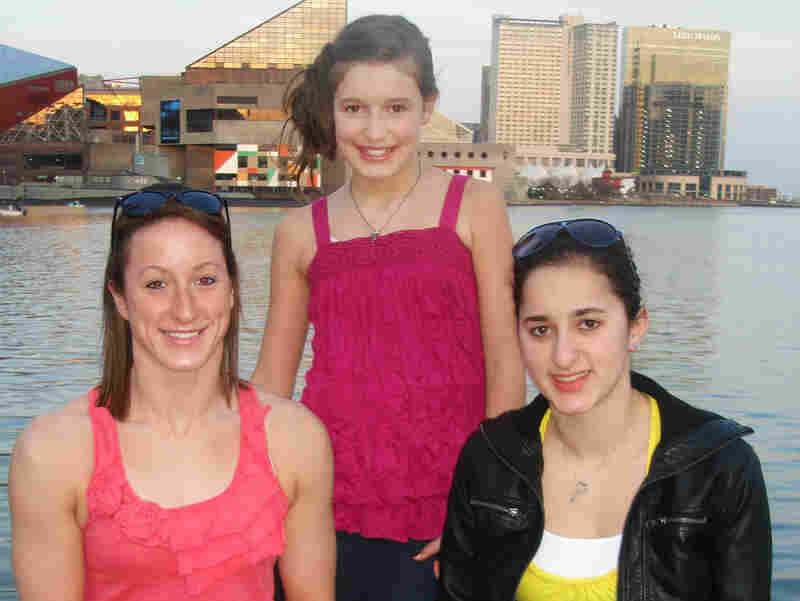 "
Tatyana McFadden (left) with her sisters Ruthi, 13 (center), and Hannah, 16, who were both adopted from an orphanage in Albania. Tatyana competed in her first Paralympic Games in Athens when she was 15. At the end of that summer, she came home and started high school at Atholton High in Howard County, Md. She wanted to be part of the high school track team. But on the eve of the first track meet, the coach refused to give her a uniform. She wouldn't be allowed to compete. After her mother complained, Tatyana was allowed to race, but not side-by-side with her teammates. At her first meet, her teammates and other competitors in the 400-meter race ran first. Then the track meet stopped and Tatyana was allowed to race — going around the track in her wheelchair, racing against no one. "That was the most humiliating, embarrassing thing I've ever done, ever," she says. She didn't want to be the girl in the wheelchair; even then, she wanted to be seen as a top athlete. "People look at you and in their minds [they] see, 'Oh, the girl with a disability in a wheelchair is running for a high school team. Congratulations.' And for me as an elite athlete, it's not what you want as an elite athlete." Tatyana and her mother sued the Howard County Public School System, which bitterly divided the community. Deborah McFadden had been the head of the U.S. Administration on Developmental Disabilities in 1990 when President George H.W. Bush signed the Americans with Disabilities Act, which banned discrimination against people with disabilities. The lawsuit sought clarification on how disability civil rights laws applied to high school sports. Tatyana wanted to compete alongside other high school students. Tatyana McFadden, was featured in a BP campaign tied to the London 2012 Olympics. In 2006, a judge issued an injunction allowing her to race. A final agreement was worked out with the school system the following year. Later, Maryland legislators passed a law that expanded the rights of students with disabilities to compete in school sports. More than a dozen other states have since passed similar legislation. "So it was definitely a tough battle but it's worth it," says Tatyana, who looks to her sister. She says she thought about Hannah and future generations when she sued and then advocated for the state law. Hannah, who walks with a prosthetic leg, says her sister's battles, just a few years ago, made a difference. She's a junior and on the track team at her high school. "I love being on the track team," she says, "It gets me involved. I've been treated equally. I've been given a uniform. Thanks to Tatyana, I don't have to fight every day with people, and I get that respect and I get to be on the team." More opportunities have opened for Tatyana, too. She attends the University of Illinois on an athletic scholarship. More and more of those are being offered to student athletes with disabilities. 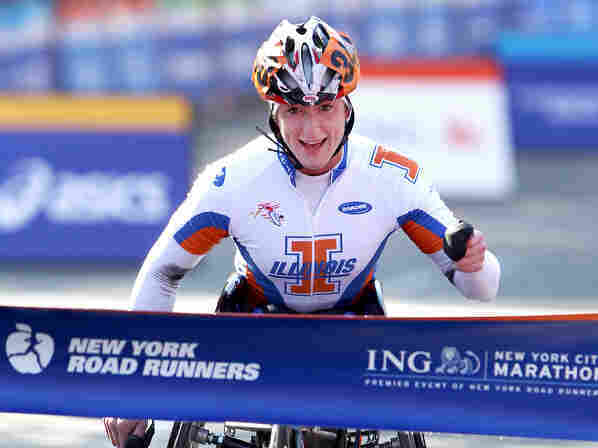 Tatyana McFadden was the wheelchair champion for the 2010 ING NYC Marathon. For the Paralympics, she has corporate sponsors, including BP, which ran black and white TV ads during the Olympics that showed Tatyana racing. And U.S. Paralympians now train with Olympic athletes at U.S. Olympic Committee training centers under the supervision of the same Olympic coaches. With better training, more opportunities and better equipment, more people with disabilities are involved with sports — and getting better and better at it. "For me being 23 and Hannah just being 16, we are nowhere near our peaks, and I think that's what makes the sport really exciting to watch," Tatyana says. "We're crushing world records and the sport's getting faster and more competitive." The two sisters will line up in nearby lanes in the 100-meter sprint on Saturday, Sept. 8. But before then, Tatyana will set out on another first. She'll participate in every wheelchair race from the 100-meter sprint to the marathon. It's an exhausting schedule, requiring her to compete over seven straight days. Her first competition — the 400 meters — starts Monday. 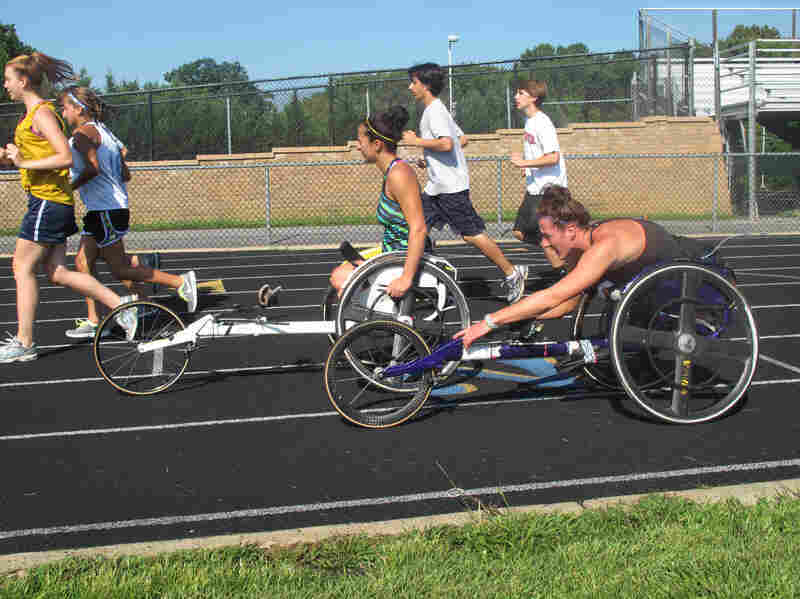 Tatyana McFadden (front), and her sister Hannah practice for the Paralympics on a high school track in Columbia, Md. Last month, before heading to London, Tatyana and Hannah got in one last practice, on a high school track in Columbia, Md. They practiced their starts in their sleek racing wheelchairs, made of carbon fiber to keep them ultralight at just 10 pounds. The chairs have high wheels in the back and then taper down to a long point at the front. Tatyana's chair is purple. Hannah's is yellow. The young women prod, push and tease each other. Tatyana's shoulders are broad. She pumps her muscular arms to push the wheels on her racing bike. Their mother watches. "I never set out to say, 'Hmmm, I wonder how I can make her a Paralympian,' says Deborah McFadden, as Tatyana rushes past. "I was thinking, 'How can I keep her alive?' "